Anderson Cooper took a very different tack last night in trying to make sense of the Arizona shooting tragedy from the weekend. While many on cable news were turning down the partisan rhetoric, AC360 producers booked comedian Bill Maher, who was unafraid to compare the imagined mindset of alleged assailant Jared Loughner with Fox News host Glenn Beck, while at the same time calling for responsibility in the media. Huh? Yeah. I mean, not direct blame. No, this guy was clearly a nut. I mean, a schizophrenic, a paranoid. I don’t know. I’m not a psychologist. Nut is the layman’s term. But he was very anti-government. If you read some of the stuff that we have, that we know he wrote, i mean, it’s sprinkled with things, anti-government ideas, treason, tyranny, the gold — get back to the gold standard, that kind of stuff that seems like, you know, I don’t know who else but Glenn beck talks about that stuff. I’m not saying he was specifically listening to Mr. Beck or anybody else. But Glenn Beck is also a little nutty. I mean, you know, this Jared guy’s chalkboard in his basement, I’m not sure it would look that different than Glenn Beck’s chalkboard. I think it’s disingenuous for the right wing, as I’ve heard them say today, that we can’t make any connection here or else the — or the false equivalency argument that I hear, you know. There’s a lot of nuts on the left, too. yeah, there are nutty people on the left, too. They don’t make threats. They don’t talk about guns. I heard someone on NPR today say, well, when Bush was president, there was Bush equals Hitler signs. From who? Not from someone in Congress. Yeah, there’s always going to be some nut out there. I don’t know who had that sign, but Sarah Palin put the cross hairs up on her website. That’s a person in a position of authority. Her other example was, you know, Keith Olbermann says worst person in the world.” Well, first of all, it’s comedy. It’s tongue in cheek. And it’s very different than what Alan West talks about, what Michele Bachmann talks about. I want to, you know, keep my opponents scared to come out of his house. I want Minnesotans armed and dangerous. Sharron Angle with 2nd amendment remedies. Nobody on the left is saying it would cause a rational person to do something crazy. We’re saying it goes out to the borderline cases, the nutty people. but it’s always from the right. 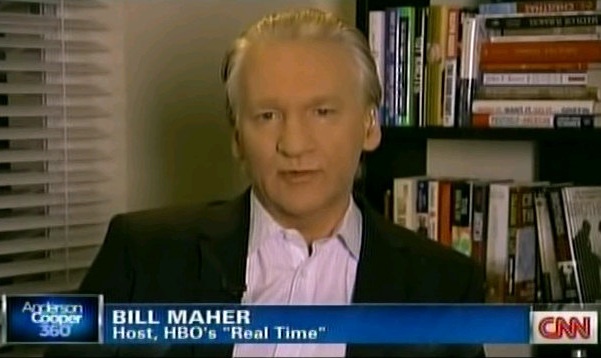 Bill Maher: This guy was a nut. He probably was going to do something. but, you know, the people at his college were afraid of him and thought — one of them even said, he’s going to bring in a rifle one day. i think it’s interesting to note that at the end of the day who he did wind up shooting was a Democratic officer of the federal government. Maher: Don’t know — sorry — I don’t agree with that. from the things I’ve read, he mentions government being controlling and too big and government is this paranoia. Glenn Beck talks about it all the time. Again I’m not saying they’re equivalent. I’m just saying i think Glen Beck say little off, too. The comments made by Maher last night stand in stark contrast to the sober and reasonable opinions put forth by other “lions of the left” Jon Stewart and Rachel Maddow, who both took the high road in their adjudication of the media’s role in the weekend tragedy. The difference? Maher is, at heart, a polemicist, and he probably didn’t disappoint his loyal fans that were looking for entertaining commentary. But for Maher to so neatly compare the troubled mind of Jared Loughner to Glenn Beck is remarkably irresponsible and unfair. And in the interest of “keepin’ em honest,” the booking of any comedian to provide insight on the media landscape and its effect on the tragic shooting in Tuscon is not the proudest moment by the producers of AC360.